What’s in a name? For our lead protagonist, the one thing she can’t remember about the man she loved, a man who died violently from an outbreak that decimated the human race, is his name. All the memories of shared laughs, tears, and lust are there — but why can she not just remember his name? The irony of this short film, directed by Jeremy M. Brown, is that neither the man or the woman who are the focus of this story, have a name. They are credited neatly as “Woman” and “Man”. But as Woman continues to dwell over emotional memories of what love and life were like before the end of mankind, which has left her stranded and alone in a desolate world, she struggles to remember just that one last detail: what was his name? 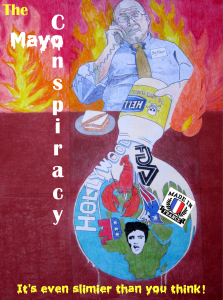 Review of "The Mayo Conspiracy"
Promoted as a mockumentary of the seedy underbelly of the condiment industry, The Mayo Conspiracy highlights the cartel referred to as “Big Mayo” and their grip on America’s condiment usage. How much power could Big Mayo hold over the public? If you believe the facts revealed in this film, Big Mayo had hands in some of the biggest events in American history, from the JFK Assassination, to the CIA’s clandestine attack on the ghettos, to the Bill Clinton/Monica Lewinsky scandal, and the most recent controversy over the newly passed Affordable Care Act promoted by President Obama. The white devil’s condiment is just one tool wielded by the condiment establishment to keep control over the populace, but it’s unobtrusive nature makes it one of the most powerful. The typical citizen may not have any idea how ingrained in our society mayo has become, and while this film is satirical in nature, this reviewer believes that the filmmakers have used their jokes to hide some disturbing facts in a way that gets the word out to investigative viewers while protecting themselves from the mayo cartel’s vengeance.